Random Cave Map Generator. Did I mention this one already? Just check it out. Medieval Demographics provides some numbers for fantasy worlds. Use the Kingdom generator that is based on medieval numbers to generate your own. Crystal cave your players might encounter in the twilight peaks. Crazy D&D session played on the Microsoft Surface. Here’s another demo walkthrough. I want it for Earthdawn! Earthdawn.pl’s 10th anniversary is being celebrated as you know. Their competition is over now and the winners will be published in regular posts one by one on their page. The following text is part of the 10th anniversary and it was one of the first texts on EARTHDAWN.PL and it is at least as old as the site. This text gives a great insight into the history of Barsaive, the working of magic and the parties that shape Barsaive until today. It is especially a great work because of the narrative style, it let’s us see the world through the eyes of the long living Obsidimen. Translation of the words of Omasu, obsidiman Merchant from Travar addressed to obsidiman Otolk from Ayodhya during his first journey after the Awakening. The origins of the story you are about to hear go back to thousands of years ago, but let us not dispute about those distant moments, for we will have a lot of time for that in the future. Allow me now to tell you about the events of most importance that had the decisive influence on what the Barsaive and we, its dwellers are now. So listen carefully, because this lesson you should memorize for the rest of your life. As you know, in the south west Barsaive lies the city of Vivane, ruled by the mighty Theran Empire. This nation was founded by the students of an elven scholar, Elianar Messias, who for his greatest finding paid the ultimate price - he gave away his own life, so that we could have a chance to live. For you should know that their knowledge and power Therans have built on the books found by Elianar, books which he himself named the „Books of Harrow" and although him they led to insanity and death, us gave hope for survival of the most difficult time in our history! You probably thought to yourself that the burden of such an existence is impossible to bear, that life conducted this way would only end in a collective madness and bloody carnage, which would occur no matter whether Horrors were involved in it or not. There is much reason in this, however the kaer dwellers had two things that allowed them, at least to some extent, to survive. These two things were hope to see the sunlight, the stars, the vast green leas and the forests of Barsaive and a book called "The Book of Tomorrow", prepared by the dwarfs from Throal, the largest kingdom in our province. What they contained was our history and culture - the heritage of all denizens of Barsaive. Do not be surprised therefore, that in most places in our province you will be able to communicate with strangers in the dwarven language - "The Book of Tomorrow" is an obligatory book for all of us even today. Residents of Barsaive managed to survive – although many shelters were indeed destroyed and their inhabitants killed or, even worse, transformed into horrible monsters, inspiring fear among the living no lesser than Horrors themselves, nevertheless a large number of Namegivers was saved. However, the survival of the Scourge did not mean the end of all troubles - the world denizens of Barsaive found after leaving their shelters is completely different from the one they remembered from the stories of their ancestors. Once lively forests are full of yet unknown monsters resembling decaying corpses, fertile lands are covered with dust, which makes breathing impossible, not to mention letting the sun rays reach the earth so it could yield fruit! Fortunately, not all places have been corrupted by the Horrors - a large part of the land is in a condition good enough to live on it and cultivate it, or at least, with Passion's blessing, adapt it to the latter. Still, even these areas hold threats, as not all of the Horrors are gone from our world! The level of magic ceased to fall about a hundred years ago, the causes of which could not be determined even by the most prominent scholars, and what powerful Horrors were able to take advantage of and keep searching for the souls of people susceptible to corruption, break their will and inflict as much evil as it is possible! There are also other enemies which the residents of Barsaive have to cope with - the Theran Empire wanting to regain authority over the province, frightening cultist organizations in the service of Horrors or Mad Passions and last but not least there are Namegivers themselves, whose lust for power pushes them to acts so vile that even the worst Horrors would not be suspected of such behavior! In this difficult situation you are to live and experience our, nevertheless, beautiful land. Only you can decide which path you will follow, and what you will achieve, however you must know that, as perhaps never before, right now Barsaive needs brave heroes who could lead us in the right direction, towards freedom and happiness. Yes, my dear Otolk, Barsaive has many legends and many heroes - but today, our world is awakening - today is the Age of Legends - legends carved with the greatness of our own hearts! Besides that France got one of the most beautiful national anthems in the world, their English accent is also simply the best I’ve ever heard . But you are here on the Earthdawn Blog and it isn’t my intention to talk about the French and their anthem, no I want to inform and talk about Earthdawn in France. The best is to start with the beginnings of Earthdawn in France. 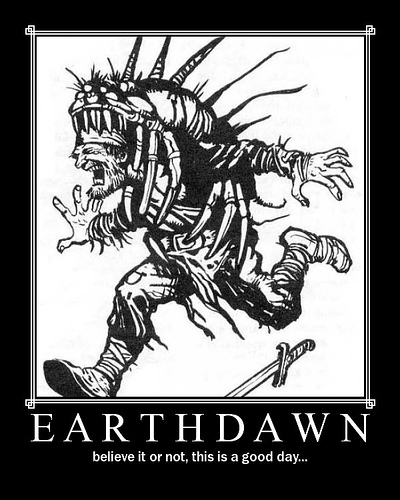 The first edition Earthdawn rulebook (Earthdawn – prémière edition – livre de base) was published in France 1996 in French!!! Only 3 years after the original FASA edition rulebook was published. But that’s not all they recently (September 2009) released the first novel in French. It is “Dark Shadows of Yesterday” (“Les Ombres noires du passé”) French players can buy for only 9,90 € !!! But the best or worst (more jealousy!!!) as you see in the table above Black Book Éditions released a “Limited Edition” of the 520 pages thick Players Compendium. Only 200 copies were sold and the hard leather cover with golden throal symbol only costs 74,90 €. Jealousy!! I also found out that they are currently working on the translation of “Prelude to War” and announced the release for November 2009, so I guess the book is not far away. I got no information if the Earthdawn Third Edition will be translated into French. I guess they have enough to do translating the Classic Edition and that there might be no publisher who wants to battle with Black Book Éditions at the moment. But now enough of the published French Earthdawn books. I want to inform you a little bit about the places on the net, where French Earthdawn fans meet and support Earthdawn. One of the oldest addresses on the net is the French Yahoo Mailing list for Earthdawn. It exists since 1998 and, as I was told, 28.0000 posts were made since then. And as I saw at my first visit the community is still active there. As you might know French is a language that is spoken in various countries and that’s why the French community is supported from Canada, Belgium, Swiss and of course France. It looks like that there are 3.000 to 5.000 players in those countries but only around 20 to 300 of them are active in communities or forums. But there are several good pages that you should have a look at. Even if you’re not capable of speaking French maybe you should use these buttons of Google to quickly translate the pages into your preferred language. As on my previous posts of EWW I wouldn’t be able to provide those information without the help of several insiders. This time many thanks go to Scorpinou, Mahar and Fred Troll grognon. Funny thing at the end. As I was told Mordom can be translated as “mort d’homme” which means “dead man”. First I wanted to add this one into the next Link Advice, but I think it’s worth to be mentioned on its own. I recently discovered an old RedBrick interview from 2004. Yes it took me over 5 years to find it. It was held between Matt Wilson from “The Circle of Four” and RedBrick, mainly James. I tried to contact Matt to get his permission to post the old interview over here, but it looks like he is no more into Earthdawn or working on his page (emails not delivered). That’s why I just post some excerpts over here, if you want to read the whole interview head over to Matt’s circleoffour page. Keep in mind it is from 2004. COF: Can you tell us who you are and what you're responsible for within RedBrick? How is the cleaning job going and are you still needing someone to make the coffee? RB: Let's see. Richard Vowles looks after the web site programming and development, on top of being a Director in the company, and keeping on top of projects generally. James Flowers is the Line Developer for RedBrick's Earthdawn products, and is also a Director in the company. He's kept busy sorting out what's going out the door, working with the current crop of writers and answering questions, posting on forums, that sort of thing. Marcus Bone is our editor, associate and conscience. He's being kept busy at the moment working through content, but his real focus will be on assisting with print production, as that's his background. Conan McKegg is the quiet one in the troupe. An associate, he has several products published in the industry and lends us his experience. Also part of the troupe is Kim Flowers, who looks after the royalties and payments side of things; Paul Tobin, who is now getting more actively involved with the artwork side of things; and Michael Sheehan, who is involved with in-house writing and additional project management tasks. The cleaning job is going well—it pays the bills—and if you can make great coffee, you are always welcome! COF: Who is RedBrick, where are you based? and how did RedBrick come to be formed? RB: We are based in Auckland, New Zealand's largest city (just over a million people). Not Australia—we're the double-island chain further down toward the South Pole. *smile* NZ's biggest claim to fame of late, I guess, is Peter Jackson's "Lord of the Rings" trilogy, which was filmed here. A couple of associates live in Wellington, the capital city of New Zealand (about 8 hours drive from Auckland). How did RedBrick come to be formed? Hmmm. Sort of by accident, to be honest. James has been GMing Earthdawn since……………. COF: Windling Swordmaster or Obsidiman Warrior?? RB: Obsidiman warrior. Strong and reliable. Again you find the complete interview over HERE. Enjoy.